Everyone’s faith story is different. People of all faiths share their personal experiences in this inspiring collection of amazing stories about the number of ways people discover, or rediscover, their faith — whether it’s Protestant, Catholic, Jewish, Buddhist, Muslim, Hindu or any other religion. 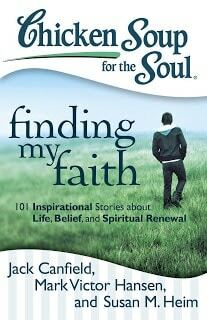 These inspirational and powerful stories will touch the hearts and souls of readers. Disclosure: I was not financially compensated for this post. I received a copy of the book as compensation. Chicken Soup Books are the best, no matter what the topic area may be. I love the Chicken Soup for the soul books.I have most of them. Chicken Soup books inspire to be a better person.